The demand within the global market for egg protein has been rising on account of the growth of the food industry, finds Transparency Market Research (TMR). The competitive dynamics of the global market for egg protein are heavily influenced by the presence of multiple vendors in the market. The easy procurement of egg protein has led to the emergence of several new players in the global market for egg protein. 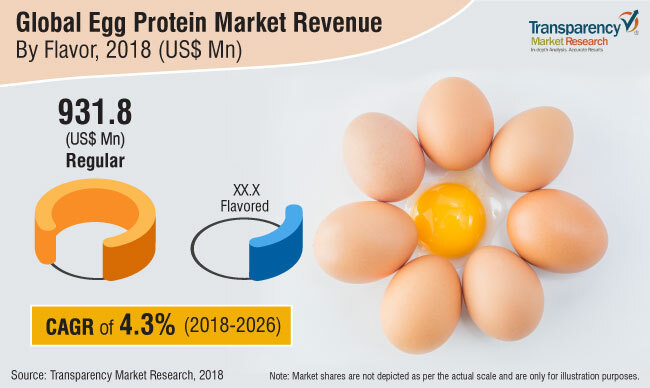 Moreover, the rising demand for egg protein from multiple domains within the food sector has also led to the uptake of egg protein business by multiple vendors. There is a stellar demand for improved food products, and hence, there is an onus upon the market vendors to deliver unadulterated egg protein. The leading vendors in the global market for egg protein have been focusing on building improved production capabilities in order to attract a larger consumer base. These vendors have also resorted to unique advertising hacks in order to fetch the benefits of distinctive marketing. The smaller vendors in the global egg protein market are sticking to the fundamentals of market growth, and are expected to follow the strategies of the leading players. Transparency Market Research (TMR) finds that the global market for egg protein would expand at a stellar CAGR of 4.3% over the period between 2018 and 2026. Furthermore, the global market for egg protein had a total worth of US$ 1056.4 Mn in 2018. This value is projected to increase by the end of the forecast period. Based on end-use, the egg protein is expected to attract the highest demand from the confectionery industry. On the basis of geography, the market for egg protein in North America is expected to expand at a stellar rate. The use of egg protein in the confectionery and bakery industries has played a major role in the growth of the global market. Several new bakery products that are rich in egg protein have been introduced in recent times. Moreover, the demand for protein-rich food products has also increased amongst the health conscious consumers. The advent of specialised fitness supplements has also led to increased demand within the global market for egg protein. The use of egg protein in the manufacture of health drinks and shakes has also played a major role in the growth of the global egg protein market. The past decade has witnessed the introduction of several infant food products. These products are specially manufactured to cater to the requirement for minerals, vitamins, and protein in infants. This factor has also led to the growth of the global market for egg protein in recent times. Moreover, the use of egg protein in meat analogs, spreads, and dressings of sandwiches and other food products has also led to the growth of the global market. Vegan lifestyles of the masses do not favour the growth of the global egg protein market. However, there is a huge population of people that prfer egg protein over any other protein source. The review is based on TMR’s report titled, “Egg Protein Market (Flavor - Regular Egg Protein, Flavored Egg Protein; End Use - Bakery and Confectionery, Protein and Nutritional Bars, Breakfast Cereals, Functional Beverages, Dietary Supplements, Sports Nutrition, Infant Nutrition, Prepared Foods, Meat Analogs, Dressing, Sauces & Spreads, Pharmaceutical Products, Personal Care Products, Dairy & Desserts, Others; Function - Thickening, Leavening, Binding, Preservatives/Antimicrobial Action, Emulsifying, Crystallization, Others) - Global Industry Analysis, Size, Share, Growth, Trends, and Forecast 2018 – 2026”.